2.5 x 7", on board. Lithographic print. Inscribed on verso: "Office Generic Files Trionyx sinensis"
unknown, . 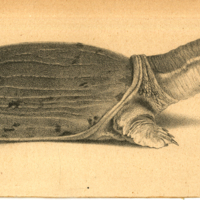 “Chinese soft-shell turtle (Trionyx sinensis).” Herndon G. Dowling Collection, MS 059. WCSU Archives, 6 Nov. 2018. Accessed on the Web: 24 Apr. 2019.